1) The last two times I was in Macau, they had a pretty awkward situation with their currency, the Macau Pataca. Essentially, 2 years ago when I was there last, the Pataca was rarely, rarely used. Rather, the de facto currency is the Hong Kong Dollar, which is constantly pegged at a 1:1 ratio with Macau Pataca. The last time I was there, I withdrew money from an ATM in HKD due to that being the only option (though mind you, it would be idiotic to withdraw in Patacas--it's just a completely useless currency). 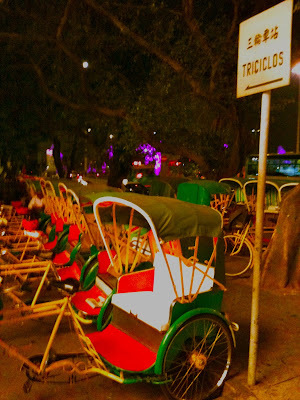 Anyway, this time around, I noticed a lot more wide usage of the Pataca. I only had like 1 transaction where the change was given in HKD, everything else was given in Patacas. Fairly interesting, I'm not entirely sure why they're using this currency system, it would probably make more sense to just say "OK, we're going to make the Hong Kong Dollar our currency, the Pataca is no longer valid", or say "OK, we're going to have the Petaca be our currency, we no longer accept HKD". This would eliminate the really awkward getting/giving money in 2 different currencies at routine transactions, and just make things much easier. Could this acknowledgement and embracing of their own currency be an indication of enhanced nationalism by Macau? It would be an interesting thing to look into--I would imagine it would be that or alternatively just really strong encouragement by the Macau Central Bank, I doubt it's just incidental. Anyway, something to think about. 2) Macau is not Vegas. Obviously I already knew this to a certain extent, but I really noticed this time around that Macau lacks fun. Between my last trip to Macau and this one, I spent a week in Vegas with my friend Dan, and I just noticed that everything there was fun. Even when you're in the poker room, the banter is fantastic, the dealers generally pretty talkative/casual, and just a generally merry atmosphere. In Macau, people are not there to have fun. They are there to gamble. The Chinese take gambling more seriously than anyone I'd ever seen--and really I didn't care for it. Whether you're winning or losing money in a casino, it will almost always be more enjoyable if there's just a cheery, friendly atmosphere. In Macau it's sort of like "well thanks for your money, if you don't have any more then you're welcome to leave right now". This assertion is reflected in a statistic that I recall which said that in Vegas, about 40-50% of casino revenues come from gambling. In Macau, that number is >90%. And Macau being 5x the size of Vegas in terms of overall revenue anyway (~$40B to ~$8B....incredible! ), this just means the amount of gambling going on in Macau is insane relative to Vegas. 3) Poker is not an option in Macau. Jeff and I got on 4 different lists for 4 different poker rooms, and the shortest of them all was about 2 hours--this meaning that we had to wait 2 hours before we got into a poker game, because there were like 40 people on the list. Now I'm not 100% sure on this, but I have to assume that in Vegas, when the list gets to like 6-7 people, they just start a new game with those stakes and have those people sit at a new table. Apparently this does not happen in Macau. Pretty disappointing, given that I just really prefer poker to literally any casino game--and I'm better at it (that is to say, it's not a losing game, in general). So kind of a bummer on that front. Ended up losing a fairly substantial amount of money--a few hundred US$--but eh, what can you do, and I suppose a good lesson that I should probably never play craps while on about 4 hours of sleep and you've just learned the rules of the game. So goes without saying, I will not be gambling again for awhile, with the exception of sports bets/prop betting with friends. This photo is of the ruins of St. Paul's Cathedral, a cathedral built by the Portuguese (Macau being a former Portuguese colony) in the late 1500's. The cathedral was destroyed in 1821, but the facade is still there (and in remarkably good shape!) At the time it was one of the largest cathedrals in Asia, and is still a pretty impressive sight. 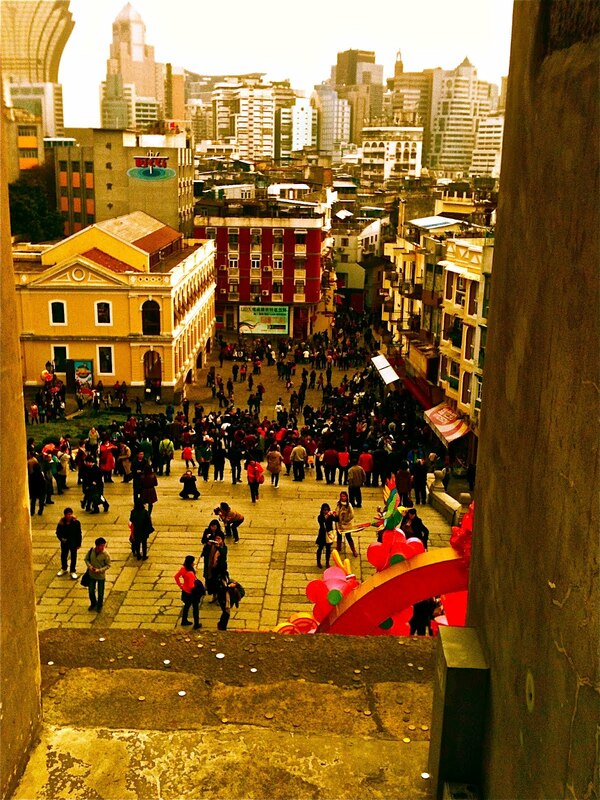 This photo is of the downtown-ish area of Macau, taken from the facade of the Ruins of St Paul's. 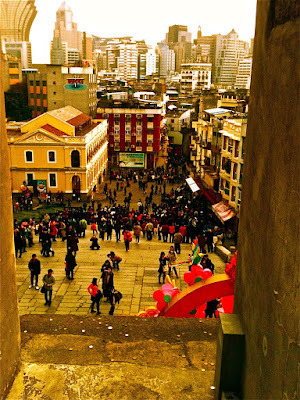 Notice the Grand Lisboa at the far left, as well as the pretty vibrant, Southern-European style colors of the buildings. 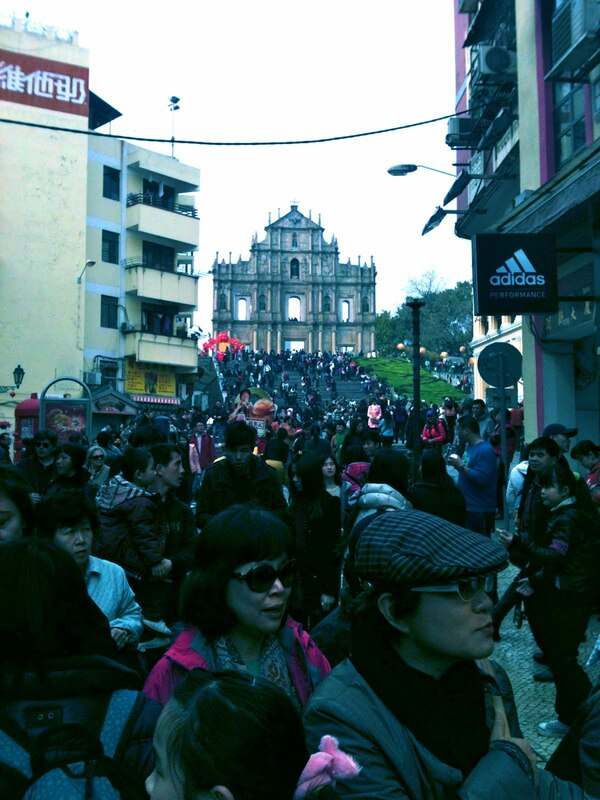 Really really interesting mix of Chinese and Southern European, Macau. It was, after all, the first European colony in Asia, and the last one in Asia, with the Portuguese establishing presence there in 1557 and not leaving until 1999. But anyway, whether it's the abundance of Vespas or the very Southern European style food or the cobblestone shopping streets, it really reminded me quite a bit of Italy, which isn't too surprising given that I assume Italy and Portugal are pretty similar in terms of lifestyle/attitude. This was on the inside of the Venetian Hotel on Cotai Strip, just an absolutely ridiculous building. Casino can be seen below. Anyway, so that's about it from Macau. Lot of passport stamps, petacas, and Portuguese. Interesting song shown to me by my friend Sabutai the other week--it's called Mole by an Indian band called Baageshri, not bad at all, I would highly recommend giving it a listen. Other than that, will see all 6 of you tomorrow, with another photo of the day.